This is not the first time these two teams have met in the Series. 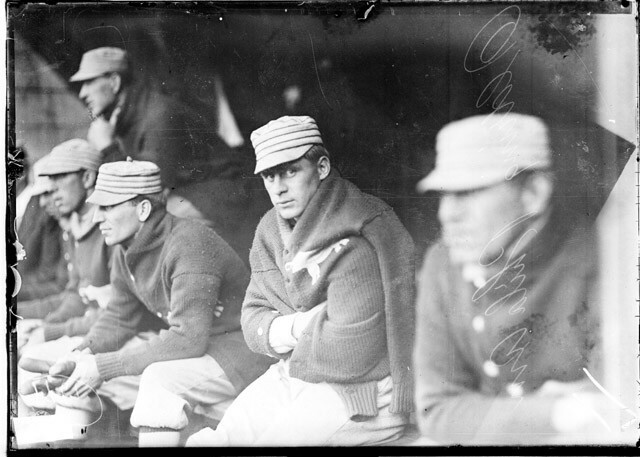 In 1905, they went head to head, and the Series helped establish Christy Mathewson as a star. 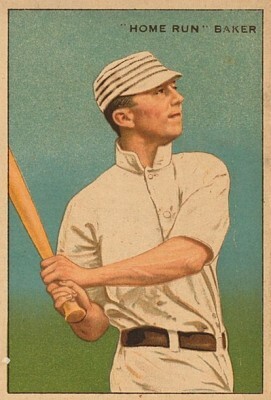 Mathewson won three games in the Series, as the Giants walloped the Athletics, 4 games to 1. Incredibly, all 5 games ended in shutouts. 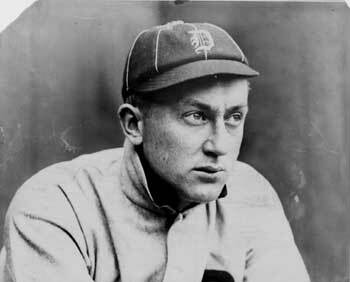 Mathewson pitched 27 innings, didn’t give up a single run, and in fact only allowed one runner to reach third base the entire Series. It has been to this point the most dominant performance by a pitcher in World Series history. 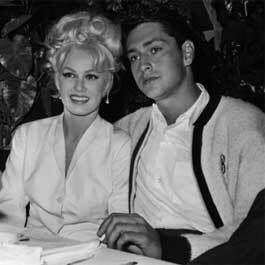 Of course, he wasn’t the only Giants pitcher with success in that Series. Joe McGinnity (who retired in ’08) pitched 17 innings without giving up an earned run either! The 3 runs the A’s scored in Game 2 were all unearned, and they were the only runs they would score all Series. It was a dominant performance by the NL champs. 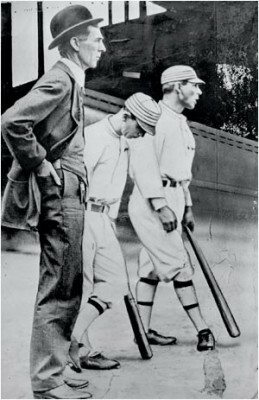 Some thought that the Giants performance in that Series was proof that they were the better team, and would win again in 1911. However, a quick look at the lineup cards indicated that this was an entirely different A’s team than in 1905. There were only 3 A’s position players starting who had started in that 1905 World Series, and they had added stars in Home Run Baker and Eddie Collins. 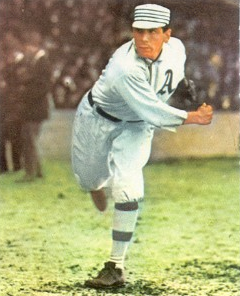 As far as pitching, the A’s still had Chief Bender and Eddie Plank, but had added the great Jack Coombs. 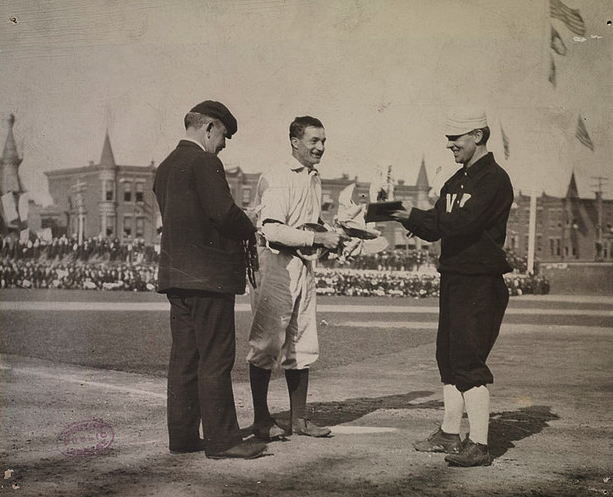 Today’s Chief Bender vs. Mathewson tilt is a rematch of Game 5 of the 1905 Series, won by Matty, 2-0. Will history repeat itself? We’ll find out this afternoon. 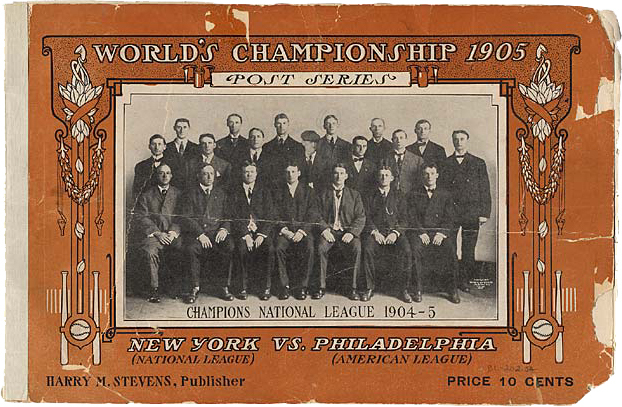 You can read more about the 1905 World Series here. Welcome to Shibe Park, where after a 6-day rain delay, we are finally ready for some baseball! Today it will be Christy Mathewson on the hill for the Giants and Chief Bender pitching for the hometown Athletics. The A’s will try to take a 3-1 Series lead, while the Giants try to knot it at 2 apiece. There are over 33,000 in attendance here at Shibe. You can follow the action live by clicking here, then clicking “View Game”. I will be back with a full report on today’s game Tuesday morning. If you have missed the first three games, game recaps complete with photos can be found below. Enjoy! If you’d like to follow Game 5, live from the Polo Grounds (above), just click here and then hit “View Game”. 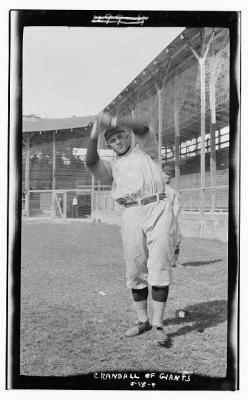 Rube Marquard will pitch for the Giants. 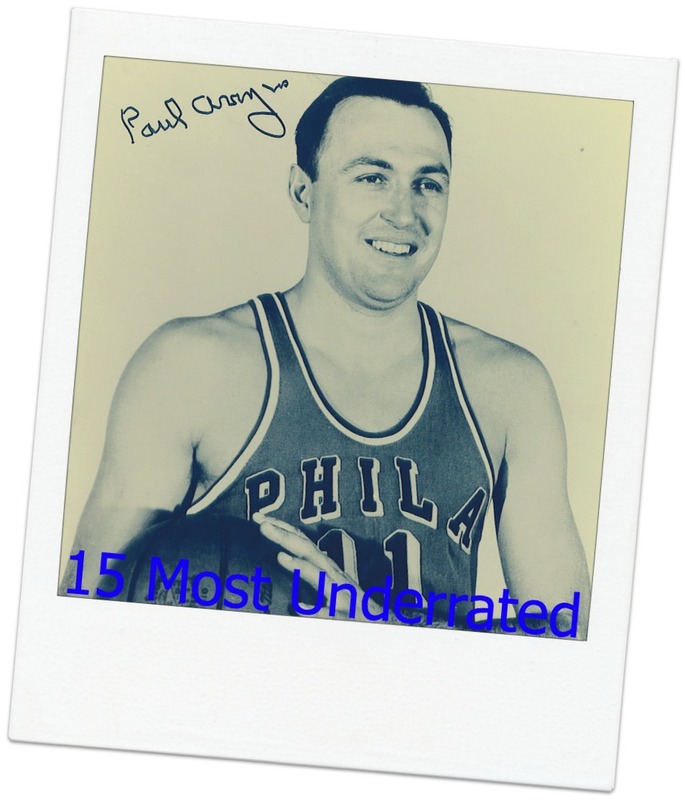 You can read his scouting report here. Marquard pitched a gem in Game 2, allowing only 4 hits in 8 innings, but gave up the first of Baker’s two daggers. On the hill for the A’s is Jack Coombs. Coombs was victorious in Game 3, completely manhandling the Giants with a complete game 3-hitter. Most are expecting the A’s to close the Series down today, as yesterday’s loss is said to have really taken it out of the NL champs. Nonetheless, both the Polo Grounds and the Herald Square (below) are packed, as Giants fans are still hoping for a miracle. There are over 33,000 at the Polo Grounds and thousands more in the street watching the Playograph. A’s fans are watching a playograph at City Hall, hoping to celebrate a World Championship today. 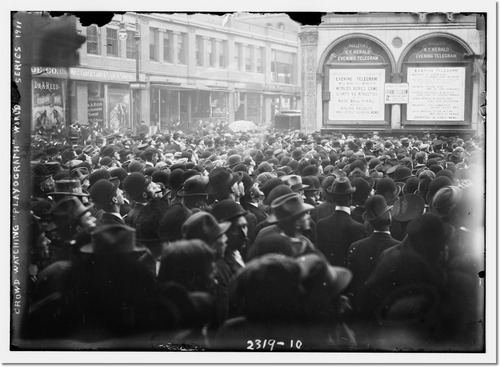 Without their generous support, this coverage of the 1911 World Series would not be possible. While you’ve been reading all about this year’s World Series, your wife has grown to improper proportions. Fortunately, the good people at Lady Betty on 8th and Market are here to help with a World Series sale. $1.50 corsets are now on sale. Has the old lady gotten so large that even a corset won’t help rein her in? 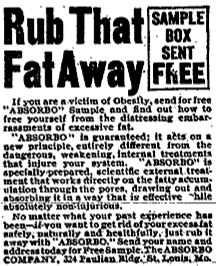 Then perhaps she should try Absorbo. As stated above, Absorbo is different from all the others that claim they’re going to make you look less disgustingly obese. And best of all, you don’t need to do a thing except rub it on and let its new principle go to work on your fatty accumulations. Finally, an opportunity to be your own dentist! Why pay a dentist to give you fillings when you can just do it yourself? Just go to Germantown, to the Galbraith Chemical Company, and get your hands on some Dento. In the future, everyone will do their own dental work. Why not get ahead of the curve? 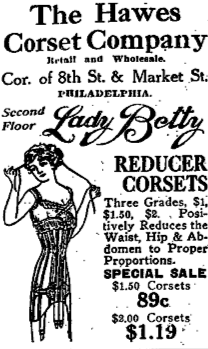 *all of these ads taken from Philadelphia Inquirer during 1911 World Series. Yesterday’s occurence was eerily similar to a play that occurred three years ago. 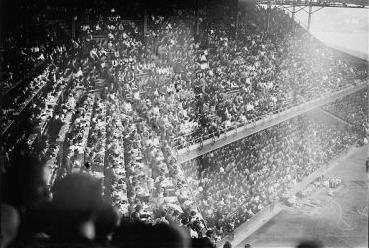 On September 23rd, 1908, the Giants and Cubs were locked in a tight pennant race. 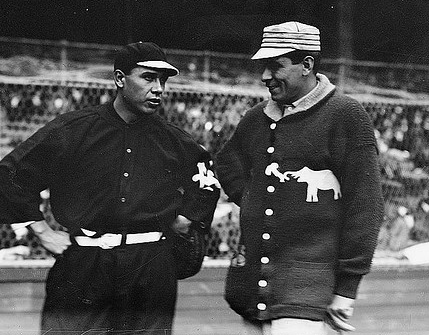 Fred Merkle (left) stood on first and teammate Moose McCormick stood on 3rd. With two outs, Al Bridwell hit a single to drive in McCormick. The jubilant New York fans rushed the field, thinking their Giants had won. 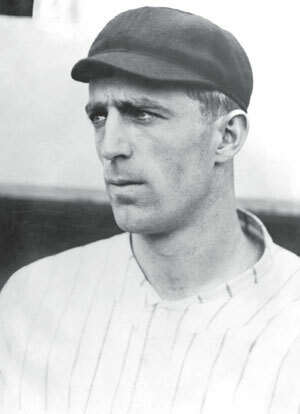 But Cubs 2nd baseman Johnny Evers noticed that Merkle had never touched 2nd base. He ran out, grabbed the ball, and running between Giants fans, went and touched 2nd base for the force out. He then told umpire Hank O’Day that Merkle had never touched second and that he was out, nullifying the run. O’Day agreed, and the game ended in a 1-1 tie. The two teams ended the season tied, and the Cubs won a one-game playoff that never would have happened in Merkle had touched 2nd. Of course, he had left the field for his safety, and O’Day enforced a rule that had never been enforced before. “I certainly did,” I said. 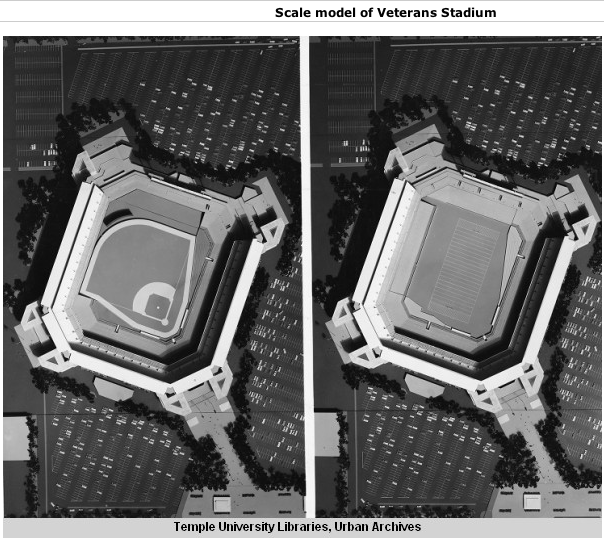 “What would you have done about it if they had appealed,” McGraw asked. It was the most pleasing moment of my life when not one of them tried to take advantage of a cheap technicality. Lapp looked around at the bench to see if I had noticed. I could see him from the corner of my eyes. I did not give him a tumble and he rushed off the field with teh rest. Now, i couldn’t swear that Doyle missed the palte, but if he did, what difference did it make? He had plenty of time to scuttle along and in my mind the Giants were fully entitled to it. I’m glad that none of my men forced Klem to make a ruling that would have been a rank injustice to New York, probably precipitating a riot and taking a hard-earned victory from the true winners and perhaps given baseball a black eye. I’m mighty pleased that my team showed themselves true sportsmen. 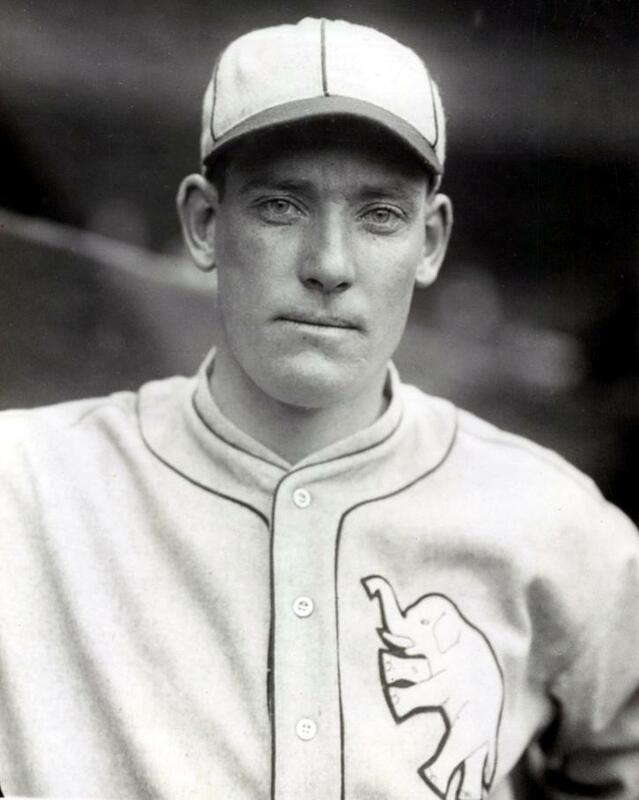 And so, Larry Doyle will not earn the nickname “Bonehead” in the fashion of Merkle, not because he didn’t make a mistake, but because Connie Mack is a fine gentleman. Hoorah to a team with such a caballero for a manager! 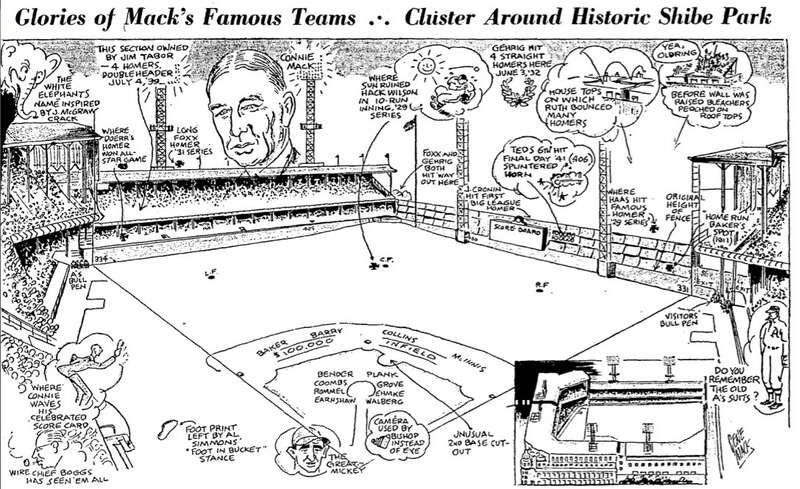 *Once again, Mack’s long quote comes to us via the excellent Norman L. Macht book “Connie Mack and the Early Years of Baseball.” The other quotes come from the October 26th, 1911 edition of the Philadelphia Inquirer. 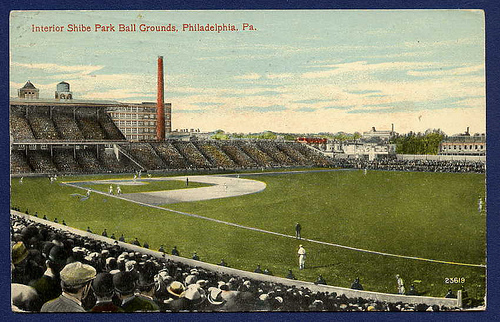 Welcome to Shibe Park for Game 6 of the 1911 World Series! 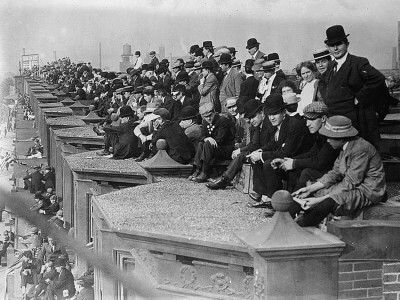 A crowd of over 20,000 is on hand at today’s Game 6 between the A’s and the Giants, with thousands more on nearby rooftops (below). The Athletics have brought out the Chief on merely one day’s rest, while the Giants must be saving Matty for a potential Game 7. They are tossing Red Ames. Ames was solid if not spectacular for the G-Men this year, going 11-10 with a 2.68 ERA. He entered yesterday’s game in the 4th inning and shut the Athletics down, allowing 2 hits and no runs in 4 innings of work. He is known for having a dramatic curve ball, which causes him to throw a lot of wild pitches. We’ll see if his wildness helps or hurts him this afternoon. To see the starting lineups and to watch the game, click here and then hit “View Game”.